Couldn't have asked for better people to work with! Unoaked Events was referred to us by our venue event manager who is also a friend of mine. We didn't even know what a wedding coordinator was but we are so happy that we hired Unoaked for the job. Adam and Alex worked with us from day 1 to make sure we created the wedding day we imagined. They had so many ideas and suggestions during the planning and created and managed so many great tools to not only keep the day and our vendors organized but to keep me organized. There are so many things to think about when planning a wedding and there's no doubt that Unoaked helped make the process more efficient, organized, easy, and ultimately really fun. Adam and Alex are beyond sweet, understanding, and have a very good way of keeping things in order while managing a very stressful month of planning, not to mention the actual wedding day! They were everywhere on the big day and were so kind to everyone: the bridal party, our guests, our parents, and all the other vendors. They somehow managed to make everything look beautiful while making sure we were on schedule and everyone was where they needed to be when they were supposed to be there. Now that I've experienced a wedding, that is no easy task! They truly made our day special not only because they made it easy and stress-free for me but because they are just wonderful people to have around. 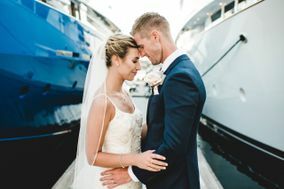 We could not be happier with the way our wedding turned out, the day absolutely exceeded our expectations and we have Unoaked to thank for that. We adore them and highly recommend them as wedding coordinators! We feel so honored to have witnessed your beautiful wedding day Briana! (Not even a strong wind could mess with your plans!) From the flower girls to your Dad’s speech, everything had heart, love and family all it! Thanks for allowing us into the family! We love you all! The PERFECT day because of Adam & Alex! I was the maid of honor in my sister's wedding, and I can't imagine her wedding day without the help of Adam and Alex. They both took away any worry/stress. Adam handled the rehearsal and got 20-30 people (bridal party, family, singers) prepared in a very short amount of time. He took multiple boxes of decor, signage, and other items that needed to be set up on the day of and made us feel like everything was truly out of our hands from that point. Everything ran smoothly because of his help. On the day of, Alex was in the room where the bridal party waited and helped with all last minute needs we had. They were able to execute everything my sister and brother-in-law wanted, and we were truly able to enjoy every minute of the day without worry, knowing they had everything covered (even things we didn't think of). I cannot think more highly of both of them, and we are so thankful for their organization and amazing help! Thank you for all of the FUN Erin! You and your sister made us feel like family from the minute we met! The love your family shared Saturday night was so moving, inclusive, and inspiring. Thank YOU for sharing your family with us for one night! Hire Unoaked for your event!! I cannot say enough about Adam and Alex. They are a true dream team! I keep telling everyone that our day went absolutely flawlessly, and that was in huge part to Adam and Alex's organization and diligence. Every detail was in place, and we did not have to think about one thing. Adam and Alex are so kind, personable, and effective! They took every last minute worry out of our minds. I am so grateful they made our day so smooth, and exactly like we envisioned. I cannot recommend them enough!! Your wedding is one I will never forget Lindsey. You and Tim are the perfect couple and share a perfect love together. I loved hearing your friends and family speak about your first date, the apartment, and watching you grow. I too, can not wait to see your family grow! Congratulations and thank you for being amazing humans! We love ya! Adam and Alex from unoaked Event Design and Productions were an absolute pleasure to work with. They coordinated our wedding day beautifully! all went smoothly due to their close attention to all details. They were so helpful all the while being sweet, pleasant, patient, understanding, and using self initiative when really needed. We would hire them all over again! We are so proud of this wedding! Thank you for bringing us into the inner circle for all of the planning and fun! From the kids, to the grand entrance and send off, it was a beautifully memorable day we will never forget! Thank you for having us! The best team to work with! The unoaked. team was incredible! Adam and Alex were so helpful, patient, understanding, supportive, and professional. Our wedding would not have happened without them. I would recommend unoaked. to anyone planning a wedding or special event. They are amazing! It was a dream come true to plan your wedding Natalie! Cheers to many beautiful years! We love you and Dave so much! I am SO glad we are family now! ^_^ It has been such a joy planning with you over the past year. Thank you for trusting us with all of the plans from across the country! It was a GORGEOUS wedding day! If I could give more stars, I would. From my first meeting with Adam and Alex, they paid attention to every detail, and were able to quickly adapt my vague wedding vision to a detailed, comprehensive plan. They were always one step ahead of me, and often knew what I needed before I could even ask. The planning was seamless, they kept me on track with a meticulous timeline and detailed itinerary, and thanks to them, I always knew what was happening when. They went above and beyond to make the day special, from their thorough planning and organization to thoughtful creativity, I didn't have an opportunity to become stressed or worry about plans, vendors, timelines or anything--they let nothing fall through the cracks! All my guests wondered how I planned my California wedding living in Texas, but for me, it was easy because Adam and Alex took care of everything. Taylor, you and Justin are simply the BEST! It was such an honor and a joy to be a part of your plans! The Footloose Flash Mob, is definitely something I will NEVER forget! Thank you for allowing us into your family! Love you and wish you two the happiest marriage! Linda, you are such an angel! It was a sincere honor to plan Taylor's wedding! I am only sad you all live in Dallas and we can't be closer friends!!! ;-) Thank you for hosting such a beautiful day and having us a part of the celebration! The flash mob will forever be a memory I cherish! Sending love to you in TX! Hiring Adam & Alex to coordinate my daughter's park/backyard wedding was the very best decision EVER! We would not have survived without them. Adam ran point on the planning -- from vendor recommendations, to site layout, to prodding and encouraging emails, he kept the process on track and moving forward. Neither my daughter nor I are party planners, so having Adam's expertise and encouragement at every turn was invaluable. Alex joined him the day-of to complete our DIY set-up, including putting flowers in vases, fluffing tulle, placing photos, adding lights to the spa, etc. They greeted and managed vendors, kept us on top of the timeline, and were the last to leave after clean-up. The wedding and reception were seamless. Not one detail we envisioned was missed, and I actually got to enjoy the party, knowing they were in charge. I am so, so glad to have had them on our team!! I appreciate everything they did for us. Several of our guests commented how nice, helpful, and organized they were. You guys are THE BEST! Carol, your family is simply the BEST! Thank you for inviting us into your home and allowing us to celebrate with you! The harp filled air at the park ceremony was.just.stunning! You hosted a beautiful reception as well. Love you and your family! Adam and Alex are amazing! The planning up to the wedding went very smoothly for us. Adam would narrow it down to 3 options for a vendor and we would go from there. Each decision seemed to make itself by the end of the process and Adam was definitely a critical part to making it so easy. The timeline was made transparent and clearly communicated frequently. Our wedding ceremony was at a park and the reception in my parents' backyard. Each of these presented their own unique challenges. He was fantastic at taking over some communication when I felt myself turning into bridezilla. He was amazing at calming Mom's nerves and being a wonderful liaison when we had differing opinions. The wedding day went more perfectly than I could have imagined! The ceremony was gorgeous and smooth as can be with Adam corralling everyone into the right spots and time! Alex set up the reception beautifully! He turned the backyard into a magical paradise! Adam helped calm me down after getting car sick and made sure I took care of myself first. Adam was excellent at modifying the plans on the spot so that I didn't have to cut the cake that would have made me nauseous, yet everyone enjoyed cake and s'mores and didn't notice anything was amiss! I was able to have everything I wanted because these guys were willing and able to pull it all together for us! Along with being professional experts at what they do, they are incredibly kind people and we look forward to continuing our friendship with them. Thank you for the kind words Janet! It was sincerely an honor to have been a part of your magical day! The Harp, the BBQ, the S'mores! It was a beautiful day. Alex and I are so thrilled to call you and Dave friends, and Carol too! :-) Cheers to a wonderful first year of marriage to you! Adam was exceptional! I will used unoaked again, and will be recomending him to all of my friends who are planning an event. He was friendly, organized, a wealth of knowledge and a calming force for our daughter's wedding. We consider him a friend. Your family is just the BEST! Thank you for having me be a part of the journey and celebration! Congrats on a beautiful wedding and a wonderfully loving family! I appreciate your kindness and trust! Thank you Adam and your team at unoaked! We felt that everything was PERFECT, truly beyond any expectations we had. The effort and thought you put into all the artistic touches created a sophisticated, festive, unique, and beautiful event! We really can’t thank you enough for everything you did and the fact that you were so calm, collected, accommodating, kind, flexible, and fun was the icing on the cake. You helped us create one of the most magnificiant and memorable days of our lives!!! Thank you. Jill, it was such an honor to be a part of your celebration! Thank you for bringing us into your family and trusting us with your ideas and plans. We had a wonderful year working with you! Fantastic experience with Adam. We would highly recommend him. Thank you Christine! I hope you two are enjoying your first days as a married couple! I sincerely enjoyed the party and the band! Your family certainly knows how to party! Hi to mom for me! Best ever!!! Unoaked. knows how to manage and execute an event flawlessly! Their involvement with my daughter's Bat Mitzvah celebration at Settebello in Crystal Cove was crucial to the success of the event and I can't express my gratitude and thanks enough! Well done! My experience with Unoaked was positive from beginning to end. Early in the wedding process, I debated over hiring an event coordinator, so glad my cheap side didn't win! Fortunately, for all involved, I hired Adam and the Unoaked team. From the outset, Adam understood the direction we wanted to go in, guided us, and never tried to impose anything on us. Throughout the wedding planning process, Adam and Unoaked were always available, always communicative, always handling each stupid question with grace and charm. Every single vendor we used, Adam recommended. And every single vendor we used was professional, easy to work with, and good at their job. I also have to compliment Unoaked on their handling of details. Lots and lots of little details go into making events successful, Unoaked knows this and their attention to detail is so superb that you can relax and enjoy your party. And you will! Thanks Adam and Alex and everyone with Unoaked!!! You guys are THE BEST!!!! Chris, thank you for trusting us with Peterson and Yueheng's wedding! It was an honor to host your friends and the Li family. Your tribe is amazing! I am so glad Alex and I could assist in this special day! Thank you accepting us into your family and for allowing us to participate in the fun! We just used Unoaked for my Bridal Shower this past weekend and I cannot say enough about the amazing job Adam and Alex did! The event was truly stunning and the attention to detail was flawless. Both Adam and Alex were constantly asking if I needed anything and I appreciated their need to ensure I was enjoying myself. I would highly recommend Unoaked to anyone!!! The shower was SO beautiful Makenzie! Your family and friends are the best! Thank you for allowing us to be a part of the fun. We thoroughly enjoyed Saturday afternoon with you! I hope your wedding day is as beautiful as you are! Cheers! Adam was ABSOLUTELY nothing short of AMAZING!!! We met with him through a recommendation from a friend and instantly LOVED him. He was organized and professional while also making you feel like you've been friends for years. He was personable and made us feel an overwhelming sense of calmness through all the crazy that is wedding planning! He took charge where we needed him to and he fully organized our special day. We had no worries in the world with Adam and he truly did deliver. Our wedding ran seamlessly and without a hiccup. I can't say enough nice things about him. My family is waiting for my siblings to start dating so he can plan their weddings in the future! If you hire anyone else, you are missing out. Love, love, love him. Thank you Tori! You looked so beautiful on your wedding day! Your Grandfathers leading the ceremony was so touching! What a beautiful celebration with so many wonderful memories! Working with Adam was a wonderful, stress free experience. The day of the event Adam and Alex took care of every detail and the event was so enjoyable. If you are looking for someone to help you plan an event, I strongly recommend them. Thank you Alisa! I was my pleasure to plan with you. I love that we have the 'same-eye-for-detail' ;-) You are the best! Thank you for trusting unoaked with this party! We had a blast! A group of us wanted to throw a wedding shower for our bride and we hired Unoaked to help. They had great advice and excellent taste in the planning stage then managed all the preparations very adeptly. Group communications was a strong point! Then on the day of the shower, they executed the event perfectly. All the guests agreed it was a lovely party. Adam and Alex are amazing. They have great taste, are extremely organized, know how to execute an event perfectly (and work with vendors), and most importantly, are so nice! We will definitely use them again and again!! Thank you for the kind words Lynn! It was truly our pleasure spending the day with you and your family. The love you have for each other is so touching and inspiring! It was an honor to have been a part of that special day. Thank you for having us! Adam and Alex were awesome to work with, they understood our vision and worked their magic to make our vision a reality. Their professionalism and attention to detail are bar none, I would use them again and highly recommend them. It was so fun planning with you Kristi! Thank you for trusting us with your vision. We had SO much fun at the celebration with you and your family. I hope we can work together again soon! As parents of the Bride, we were delighted to work with unoaked. This was a wonderful experience for our daughter, her spouse, our family, and our friends. Adam and Alex were amazing and very personable. They helped the bride and groom select qualified venues and vendors. This included detailed contract analysis and superb negotiation skills. The results were fantastic. They also made the whole process easy for us; their step-by-step analysis and updates were amazing. They were always thorough and innovative. And they quickly responded to all our inquiries. Thank you both for sharing such a beautiful day with us! Alex and I are truly honored to have been a part of planning and executing Michelle and Ryan’s wedding! Thank you for your trust and kindness. The wedding was beautiful! Working with Unoaked was a great experience. Their level of professionalism throughout the wedding planning process was second to none. They were on top of the schedule in both the planning phase and on the day of, making us feel extremely comfortable every step of the way. I really appreciated how they worked to understand our style and vision of the wedding, keeping that at the forefront of everything. This also helped in that they were able to offer vendor recommendations based on our style and personalities. Unoaked was extremely helpful throughout the entire process, and I would recommend them to anyone. It was such a joy to plan your wedding day Ryan! You and Michelle are such a wonderful couple. Seeing everyone enjoying themselves on the dance floor ALL NIGHT was amazing! Congratulations! Adam and Alex went way beyond! We threw a LOT of ideas at them and when the dust settled, we had the most magical night possible! They even threw in a few ideas themselves that were just fantastic! we HIGHLY recommend them! Thank you Greg! You and Chris were wonderful grooms to plan with! We LOVED all of the unforgettable live music at your wedding! Congrats gentlemen! Our son and daughter-in-law hired Adam and Alex to plan and coordinate their wedding and they were amazing! The wedding ceremony was in a park and they set up and decorated the gazebo and surrounding area beautifully. They greeted guests and made sure everything ran smoothly during the ceremony. It was such a good feeling to know they were in charge and they had everything under control. They transformed the airport hangar where the reception was held into a beautiful space. They thought of every detail and made sure everything was setup just as planned. Adam and Alex were everywhere solving every problem and making everything perfect. Even when minor issues came up they stepped in calm and collected and helped to solve it. This is so important because the bride and groom were easily stressed and Adam and Alex were able to help calm them down so they could relax and enjoy their day! I didn’t realize how important it is to have a wedding planner help with the process of planning a wedding and especially help with the “day of.” It made all the difference having their support so we all were able to enjoy a beautiful, fun wedding! It was SUCH a special day! I am thrilled you enjoyed the celebration. Alex and I are honored to have been a part of such a fun party! Thank you for allowing us to enjoy Brian and Erin's wedding day with you! Adam and Alex made my wedding day such a breeze. They were accomdatkng and flexible with the timeline and always kept us on schedule. They were in contact with all the vendors and checked in on us regularly to make sure we were getting everything we needed. Having them by us that day was the biggest blessing of the day because I didn’t have to worry about a single thing. They are a pleasure to work with and I can’t wait to use them on any future events! Highly recommend them, hands down! Thank you for the kind words Erin! It was an honor and a pleasure to see through your wedding day plans! The helicopter grand entrance is defiantly something I will never forget! Thank you and Brian for trusting us with your special day! Cheers!